Philadelphia City Council President Darrell Clarke announced today that he would not be entering this year's race for Mayor. 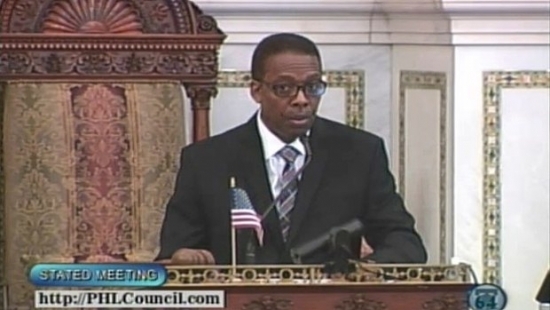 Clarke, who decision was looming for several weeks, said "I really enjoy being Council president of the City of Philadelphia, and I really enjoy being the councilman of the 5th District." Clarke would have had a lot of support from the city's business, political, and labor leaders if he decided to run. By law, Clarke would have had to resign his post on Council to run for mayor. He is currently in his fourth term as a councilman and his first as president. Philadelphia Police have identified the three men shot execution-style in a home in Mayfair this weekend. 40-year-old Ramon Ortiz, 30-year-old Sarith Mang, and 40-year-old Jason Stratos were found dead late Saturday night in the 4600 block of Vista Street by one of the victim's girlfriends. They were all shot in the head. Medics pronounced them dead at the scene. The girlfriend told police that her boyfriend called and told her to come over at 5:00 pm. When she got there no one answered the door. She called and texted with no response. She left and returned around 11:30 pm, this time going to the back door, which was opened. That's when she discovered the men. The police do not have a motive or suspects at this point. Neighbors suspect that drugs may be involved. A final memorial service was held this morning at the Mayor's Reception Room in City Hall for Philadelphia Fire Lieutenant Joyce Craig. The service is the closing of the city’s 30-day period of mourning. Craig died while fighting a basement fire in home the West Oak Lane section on December 9th 2014. The 36-year-old mother of 2 and 11-year veteran was the first female firefighter to die in the line of duty in the 278 year history of the Philadelphia Fire Department. Mayor Nutter and her brother both spoke at the service. Craig's two children were in attendance. Rain and fog, temperatures in the upper 30's this evening in Center City.